T-tops for boats, a protective covering most often constructed on center console vessels, are an essential element when you’re out on the water enjoying a day of fishing. A boat T-top protects you and your guests from harmful UV rays and excessive sun exposure. But it takes a beating out there all day in the hot sun. If your T-top canvas starts to weather or tear, it won’t be nearly as effective at protecting you from the elements as when it was new. Depending on your boat’s make and model, AmeritexDirect can help you easily replace worn out T-top canvas with a brand new, exact reproduction of the original. 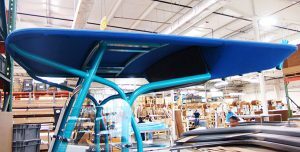 It will be custom manufactured to the same specifications as originally provided by your boatbuilder and shipped ready to install. Find out if we offer replacement T-top canvas for your boat here. Buy direct from the original canvas supplier for your boat & save!